2×6 photo booth strips, one strip for guest, one strip to stick to photo album for bride and groom. Use the booth strips for a beautiful photo poster that your guests will sign. Create custom shaped photo stickers for parties and events with hand held die cutters. Mix photos, marketing messages and branding with stickers – such as for ski helmets, skate boards, back of cell phones, running events, school lockers, bumper stickers; the list goes on. Recently, we spotted this flimsy photo booth at an upscale wedding in Sacramento. The bride thought she was getting a great deal and saved herself several hundred dollars on a budget booth. We call them 'Trash Booths'. The bride had spent tens of thousands of dollars to make her wedding day beautiful in every way- and look what the cat dragged in. Poorly built booths are also a liability- if the shoddy booth collapses on the guests and someone gets hurt, who is at fault? 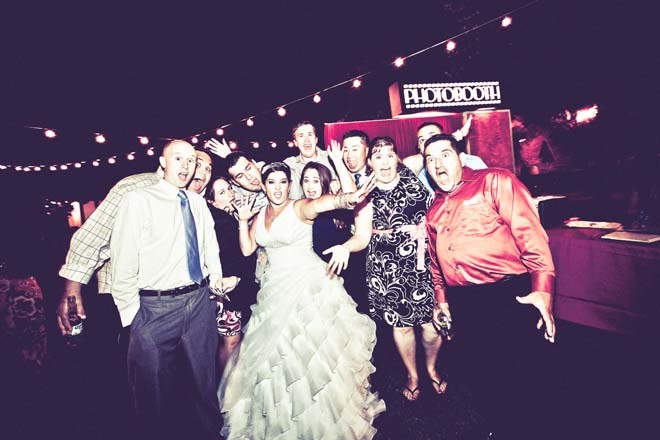 - both the bride and the photo booth company. I would also imagine was not the same booth as the booth photo the bride viewed online. We had so much fun providing our booth at Tony and Negin's wedding celebration at the Villagio in Yountivlle, CA! Photo courtesy Sam Wood, Sharp Photographers. "Each guest was provided a magnets for their pictures so they had an extra souvenir/gift from our wedding. We also had someone scrapbook all the pictures with notes from the guests. It was a fun option in lieu of the traditional guest signature book. Ours is still by far one of the most elegant books I’ve seen put together by a photo booth vendor. Our album is definitely one of our favorite pieces of memorabilia from our reception. We had a great laugh looking through it when we left our reception."